Whenever I travel away from home I obsess over creating a packing list and checking it thrice. However, creating a list on your own carries the risk of forgetting something important. Packing Pro is an app for iPhone and iPad by Quinn Genzel that is the perfect travel companion. For this review we took a look at how well Packing Pro worked on the iPad. One of the first things I noticed about the interface is that everything is wide open. There’s no screen clutter or clunky menu bars. Everything is easily accessible via the left navigation bar. What makes Packing Pro so special when it comes to creating lists? The first and foremost feature is the ability to auto generate packing lists based on a variety of travel factors such as destination, number of travelers, weather, food, and more. You can easily create a packing and to do list that features over 100 items in around 30 seconds. Packing Pro pulls items and tasks from a catalog of over 800 items. Pretty much anything you can imagine has been thought of in terms of packing and travel, which is nothing short of incredible. This is where the true usefulness of the app comes in; the app will help you remember things you never would’ve thought of on your own. One of my favorite features is iCloud integration and syncing capabilities. 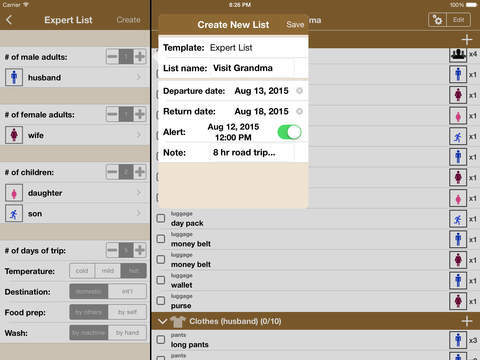 Packing Pro is a universal app and nothing would be more troublesome than to create lists on your iPad and have to jump through hoops to import them to your iPhone. Another really cool thing about Packing Pro is that it gives users complete control over their lists and access to options for moving data from one place to another. The app fully supports importing and exporting via CSV to a number of locations, from cloud storage to contacts and email. Nothing would be worse than curating an extensive packing list and losing it. If you’re into customizing the look and feel of apps, Packing Pro definitely has you covered. From changing colors with themes to organizing layouts and appearance, you have total control over everything. This might seem like an aesthetic convenience, but it’s nice to be able to make an app perfect for you. When it comes to value, I believe Packing Pro is worth every penny simply because it’ll keep you from forgetting things for your trip. There are in-app purchases for additional themes and additional 10 sample lists, priced at $0.99 each. 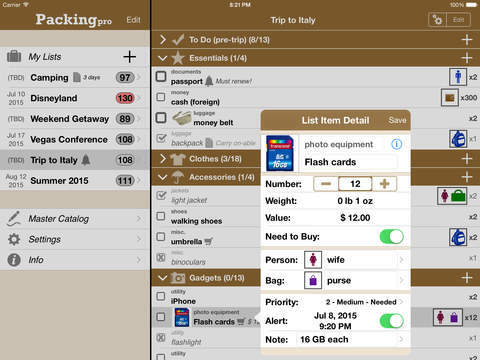 Overall, Packing Pro is an app that every traveler should have on their iPhone and/or iPad. It takes the guesswork out of creating your own packing list and offers plenty of great features. Packing Pro requires iOS 6.0 or later and is compatible with iPhone, iPad, and iPod touch. This app is optimized for iPhone 5, iPhone 6, and iPhone 6 Plus.